Our CSA box has been on apple overload for the last few weeks. Eating them plain got boring pretty quickly (pears are my fall fruit of choice anyways), so I've been experimenting with interesting ways to cook and bake with them. In the last 3 days, I've made Caramel Apple Cheesecake Pie, a plain old Apple Pie, and this amazingness. Caramel Apple French Toast. It couldn't be easier, especially if you have one of these apple corer/slicer/peeler doodads. I just got one on clearance. After I got past the fact that it looks like a medieval torture device and that it took two of the smartest men I know at least 15 minutes to figure out how to set it up, I now believe it's the neatest [non-electronic] thing I own. It definitely makes the whole coring/peeling/slicing process a lot less aversive. The recipe below is just for the apples; here is my favorite French Toast recipe. While the apples are caramelizing, make the French Toast, and before you know it, you'll be sitting down to a sweet plate of fall-inspired goodness, and copious amounts of praise from your dining companions. One last note: don't feel like you have to limit yourself to French Toast. I'm picturing this caramel apple topping on ice cream, pancakes, waffles, as a cake filling, and... did I mention ice cream?! 1. Melt the butter in a large skillet over medium heat. Stir in the brown sugar, salt and cinnamon and cook for 1 minute, until bubbling. Mix in the apple slices and toss well to coat. Cook over medium to medium-high heat until tender and most of the liquid has been reduced, about 15-20 minutes. Remove from heat and set aside. 2. While the apples are caramelizing, make the French Toast. 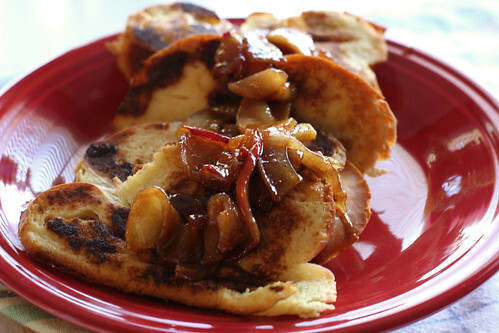 Place French Toast on plates and top with the caramelized apples. Serve with maple syrup and whipped cream if desired. I'm so glad you posted this, I saw your tweet and drooled all over the place. This is nice! I would love to have this breakfast. Sweet and delicious. I do not make french toast often enough. This is definitely the recipe I needed to get me to make it again! I'm so excited to try it one of these weekends. ridiculous. i want to be eating this, right now. barbeque accessories, I'd like to take care of our dessert. My sister's into gas barbecues sales, so perhaps she knows the whole thing in grilling. Thanks for the pie tricks!